This past weekend The Bug Out Bag Guide Family hosted a barbecue for some close friends. One of the highlights of this was testing out an alternative fire building method in our back patio firepit. Instead of building a standard teepee or log cabin we decided to try building what is called an “upside down fire”. We got some great, hassle-free results from this that we wanted to share with you. As I always say, it is always good to add new techniques to your survival skills. At the end of this article you will know how to build an upside down fire on your own! Why build an upside down fire? Where can I use an upside down fire? Can I build an upside down fire in a fireplace? Over many years of camping I have built hundreds of fires. These were mostly of the teepee and log cabin variety, with some lean-to fires mixed in as the situation required. These fire building methods have served me well and I have enjoyed many a meal and evening sitting around their warm glow. I was excited to learn about a new method of fire building and try it out for myself. What I learned from my test run, is that there are several advantages that an upside down fire brings to the table. An upside down fire is built in a layered fashion starting with tinder at the top and increasing in size all the way to large logs at its base. One of the biggest advantages of using this fire building method is that as a layer burns it progressively ignites the larger layer below it. The tinder lights the kindling, which ignites the fuel wood, which in turn lights the logs. In other words, once an upside down fire is lit it will burn by itself for hours. There is no need to baby sit it and keep adding wood over time! You can light your upside down fire and then focus on other tasks like setting up camp, preparing food, or just relaxing with your fellow campers. While traditional fires (teepee and log cabin) do progressively ignite successive layers (if properly built!) they tend to do this over a shorter period of time and require that a fire tender monitors the burn rate and add more fuel and eventually place logs onto the fire. The genius of an upside down fire is that it frees you from this chore! Being self feeding makes an upside down fire an excellent choice if you want to keep a heat source burning through a long, cold night. As it is self feeding you will be able to build it before bed, light it, and then keep warm without having to climb out of your sleeping bag or shelter. With a traditional fire you would need to set up your teepee or log cabin and as they got burning need to continually feed it larger and larger logs to get a nice bed of coals going. The upside down fire does this automatically with the same amount of wood but far less active management. Set it up, go get your food ready and then come back to a nice bed of cooking coals! Yes! People often build them in fireplaces or woodstoves for the same reasons why they are used outdoors. Wood stove enthusiasts actually favor the upside down fire building method as it tends to heat up the chimney pipe faster than a traditional fire and by doing so increases the stove’s efficiency. …And finally, the same fire after an hour burning without my intervention! 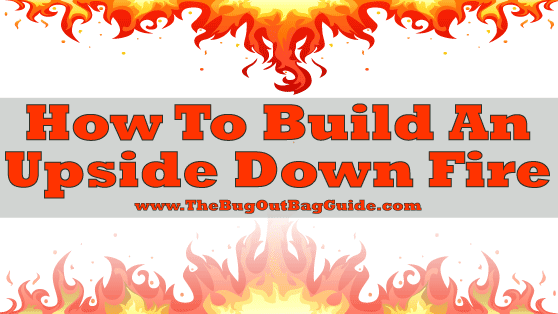 Here is a step by step guide for building your own upside down fire. Follow the written instructions and refer to the pictures if you run into any trouble. You are going to lay your base layer of logs down in the next step so you will want your pit clear of debris and as level as possible so the fire you build will not topple over as you build it up. You are going to build your base layer first. This means use the largest logs you intend to burn and lay them down parallel to each other. Have the logs all touching each other so there are no gaps between them and it is best if the tops of them are relatively level with each other so you will have a nice sturdy base to build the rest of your fire upon. You are going to use large fuel wood for this layer, larger than your thumb. Remember, this layer has to be large enough to generate enough coals and heat to ignite the logs below it. Lay this wood in the opposite direction to the logs below it and allow space between each piece for air to flow. Feel free to build 1-3 layers of this sized wood if you have enough and if you have organized your wood build each layer upwards out of slightly smaller thickness pieces. Each layer should be laid down crosswise (perpendicular) on top of the layer below, similar to the method used when building a log cabin. You are going to repeat the process used in step 3 here but using smaller fuel wood, preferably smaller than your thumb in thickness. Once again build 1-3 layers of small fuel wood up with each being perpendicular to the last layer and slightly smaller thickness. You should have a small tower of wood now with the thickness of pieces used getting gradually smaller as you get nearer to the top. Now you are going to start adding on the smaller wood that you have, kindling that is thinner than your pinky. Add 3-5 layers of this if you have enough to do so. By the time you get to the top layer the wood should be of the smallest thickness you have, no bigger than a twig. Stick to the same method of laying each layer down crosswise across the layer below it to allow proper air flow. Shelter your match and tinder from any wind (If you are lighting your fire with an EverStryke Match, you don’t need to worry about this) and get that fire started. Depending on what tinder you chose you may need to blow gently to get the tinder going. As the fire burns each layer that you built should ignite the next one down all the way to your base layer of logs. In my testing an upside down fire built as I have described should burn for well over an hour and result in a large layer of coals all ready to cook your meal. Enjoy! Your upside down fire is ready to light and enjoy! So, now you know how you build your own upside down fire. I encourage you to give it a try next time you are camping or setting up a backyard bonfire. It is a great tool to add to any fire building arsenal and I think you will be impressed with the results. Have you built an upside down fire before? Did you give our step-by-step instructions a try? Please let us know in the Comments Section below what you thought about this fire building method or if you have any tips or tricks to getting it to work better! Thanks! Love this idea for heating in a wood stove, and can see why/how people who heat with wood would love this method for building a fire for overnight heat. While my wood stove is large enough to keep a fire going most of the night, it does nearly go out by time to get up in the early morning, leaving only coals and a chilly house. I am going to try this in my wood stove for my overnight fire. Great idea! Awesome, Son of Liberty! Let us know how it goes for you. I very much liked your article on the upside down fire. Especially for an overnighter. I then linked to the 5 skills you need to know when bugging out. Which brings me to my question. Have you thought about making these posts/articles available as a pdf download. Obviously I am refering to the 5 skills (without the videos but with the pictures). Normally I just select everything, paste it to a document and edit out the dross. But it seems to me that having put the presentation together for us it shouldn’t be to hard to save it as a pdf. Maybe I’m wrong. But it would be nice to have as a pdf. That way you can also make a hard copy for your files or library if you have one. Great idea Fred, thanks. I have been looking into publishing an Ebook that encompasses many of the subjects I have written on including the survival skills you mention. I will keep you all posted once I start working on it. I like it a lot! I am going to build the upside-down fire the next time I go camping. I have been teaching my 7-year old son some basic survival skills & showed him the traditional fire starting method. Now, I find that I am not too old to learn different, better methods! Thanks Ron, let me know how the lesson goes! The upside down is a great fire because it give less smoke. But I will say that it does not last all night long. You would have to pile up a nights worth of wood. My favorite thing about this method is that it makes great coals for cooking. It is great for Dutch oven cooking. This is my first winter with a fireplace, after some early failures to get the logs ignited with newspaper below the fireplace grill I ran across this method. Now I can get a fire going that runs for 2-3 hours and usually only needs a log turned towards the very end. Another advantage to this setup is that if your kindling goes out, you are resetting on top of the pile rather than beneath. And if you suddenly need to leave the house, just sweep the burning wood off the top and they go out, and resetting the kindling is easy for re-ignition. This method changed my life. I followed directions line by line, in my home fireplace (which is a good size) and the results were astounding. A beautiful, slow burn to the bottom logs and created incredible heat. Far more than our normal method and even better than those times when we cheat and use a whole ‘3-hr log’ surrounded by cut logs to get a big fire quickly. Love this and ensures making fires is more of a pleasure than chore babysitting the initial flames. Thank you for the sound advice. A lifetime lesson well received! Glad to hear it worked for you! I was also amazed at how well this method works when I first tried it, hopefully it keeps you and your family warm all winter! Thanks for visiting the site and I am glad to hear the article was helpful to you. As for being new to the prepper lifestyle, it is never too late to learn to be prepared so welcome! 2. Or you can click on the Share Bar on the left hand of the screen, there is a button there that looks like an envelope, click on it and it will open up your mail program with a new mail that contains a link to the article. Simply enter the recipient’s email address as you normally would and send it off!